Reading and share top 13 famous quotes and sayings about Longing For Happiness by famous authors and people. Browse top 13 famous quotes and sayings about Longing For Happiness by most favorite authors. 1. 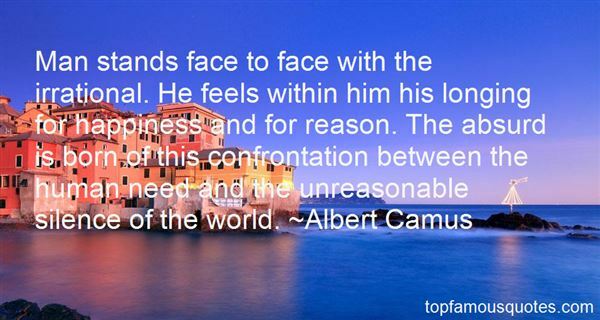 "Man stands face to face with the irrational. He feels within him his longing for happiness and for reason. The absurd is born of this confrontation between the human need and the unreasonable silence of the world." 2. "What despair to see a woman one loves longing for those thousand nothings from which women compose their happiness, and to be unable to give her those thousand nothings." 3. "This is not written for the young or the light of heart, not for the tranquil species of men whose souls are content with the simple pleasures of family, church, or profession. Rather, I write to those beings like myself whose existence is compounded by a lurid intermingling of the dark and thelight; who can judge rationally and think with reason, yet who feel too keenly and churn with too great a passion; who have an incessant longing for happiness and yet areshadowed by a deep and persistent melancholy—those who grasp gratification where they may, but find no lasting comfort for the soul." 4. "The slow arrow of beauty. The most noble kind of beauty is that which does not carry us away suddenly, whose attacks are not violent or intoxicating (this kind easily awakens disgust), but rather the kind of beauty which infiltrates slowly, which we carry along with us almost unnoticed, and meet up with again in dreams; finally, after it has for a long time lain modestly in our heart, it takes complete possession of us, filling our eyes with tears, our hearts with longing. What do we long for when we see beauty? To be beautiful. We think much happiness must be connected with it. But that is an error." 5. "I say, I can not identify that thing which is called happiness, that thing whose token is a laugh, or a smile, or a silent serenity on the lip. I may have been happy, but it is not in my conscious memory now. Nor do I feel a longing for it, as though I had never had it; my spirit seeks different food from happiness, for I think I have a suspicion of what it is. I have suffered wretchedness, but not because of the absence of happiness, and without praying for happiness. I pray for peace -- for motionlessness -- for the feeling of myself, as of some plant, absorbing life without seeking it, and existing without individual sensation. I feel that there can be no perfect peace in individualness. Therefore, I hope one day to feel myself drank up into the pervading spirit animating all things. I feel I am an exile here. I still go straying." 6. "There's a taste in the air, sweet and vaguely antiseptic, that reminds him of his teenage years in these streets, and of a general state of longing, a hunger for life to begin that from this distance seems like happiness." 7. 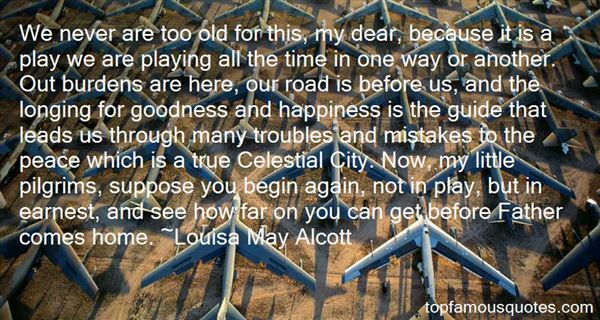 "We never are too old for this, my dear, because it is a play we are playing all the time in one way or another. Out burdens are here, our road is before us, and the longing for goodness and happiness is the guide that leads us through many troubles and mistakes to the peace which is a true Celestial City. Now, my little pilgrims, suppose you begin again, not in play, but in earnest, and see how far on you can get before Father comes home." 8. "Through embrace we flow.Wanting,Longing for happiness to flow"
9. 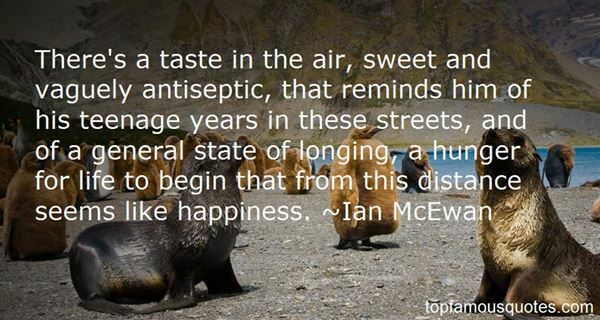 "Nostalgia is, by its very nature, bittersweet, the happiest memories laced with melancholy. It's that combination, that opposition of forces, that makes it so compelling. People, places, events, times: we miss them, and there's a pleasure in the missing and a sadness in the love.The feeling is most acute, sometimes cripplingly so, when we find ourselves longing for the moment we're in, the people we're actually with.That nameless feeling, that sense of excruciating beauty, of pained happiness, is at the core of "4th of July, Asbury Park (Sandy)." 10. "[…] we humans, as long as we live, are generally incapable of freeing ourselves from a certain ardent searching and longing, and should not even strive to; that our longing for happiness seems far more beautiful, always far more sensitive, more significant and all in all probably far more desirable than happiness itself, which perhaps need not even exist, since the fervent, gratifying pursuit of happiness and an everlasting, deep desire for it perhaps not only suit perfectly our needs, but satisfy them far better, far more profoundly; that being happy is by no means to be taken casually, unquestioningly as the meaning of the world, the goal and purpose of life, and so on." 11. "And there are places like this where time stands still,They have kept a piece of me, a longing to return The calm breeze when it touched my face, assured that I was aliveThe sight ahead was so full of life; it didn't even matter if it was the day I died ...Listen, there is a music the winds play through the leaves in this absolute silence The shining snow quilt puts the land and trees to sleep, for they have been awake through a long long summer ..Can there be a sight more adrenaline-pumping than this? No, not for me! It's a magical moment of happiness and absolution…After being lost in these woods, I throw the baggage I carry It's a moment of happiness..sheer happiness even as I think of it now"
12. "Where the Flame was burningBy the long grey roadthere is ash after a fire gone outand signs of departurein dust and heat.That is all.But the flame that burnedin the circle of the travellerswhirled only before the eyein unextinguished longing.They were travelling for a dreamand could give all,and must go on in their searchingsand their unease,and the bonfire burned onin every edge of sight,whilst new searchers dug in the ashesand in the ground under the ashes,and it is dreamthat is happinessfor those journeying." 13. "Each one of us is longing only for health and happiness, in search of a way of living in the world that will let us appreciate our bodies, make good use of our minds, and fulfill our spirits. To treat my patients well, I needed to treat them as souls rather than symptoms. I needed to help them learn how to live and live well." We are all 99.9 percent genetically equal. It is one one-hundredth of one percent of genetic material that makes the difference between any one of us."